Nevada County District Attorney incumbent Cliff Newell (right) and challenger Glenn Jennings squared off during Thursday night's candidates forum at the Eric Rood Government Center in Nevada City. Candidates for Nevada County district attorney sniped at each other at a candidate forum this week, with the challenger throwing accusations of corruption and inexperience at his opponent in one of the county’s most contentious races. Glenn Jennings argued at a Thursday forum that District Attorney Cliff Newell, running for his fourth term, has no trial experience. Jennings also invoked the ongoing accusations of wrongdoing against Nevada County Deputy Jason Mackey, who some defense attorneys have claimed has written faulty search warrants. Jennings said Newell has had five assistant district attorneys, the No. 2 position he once held under Newell, in three years. Newell argued the only chaos his office has experienced came from Jennings’ employment. “I manage the office in overseeing and have been involved in every major case in the past 12 years,” Newell said, adding his office has a high conviction rate. 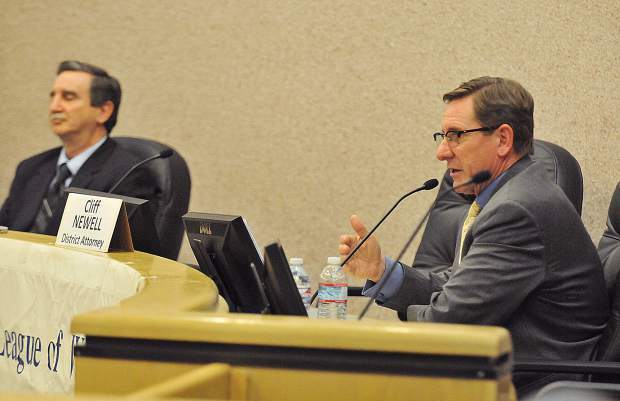 “I have no intention of changing what works for Nevada County. “When given the opportunity to manage the office, he fell short,” Newell said later about Jennings. Jennings repeatedly hammered Newell for not personally prosecuting cases, which he said is a key element of the job. Jennings has said many times he left Newell’s office over unethical conduct. Jennings has pointed to what he said is corruption involving Mackey and Newell’s office as a reason for running. He added he knew a problem existed when in 2015 Mackey told him he couldn’t testify about a drug case because of an error in a search warrant. “Those, ladies and gentlemen, are big, red flags,” Jennings said. Newell dismissed Jennings’ arguments about Mackey, saying the deputy did nothing wrong. Instead Mackey had a discrepancy in a warrant, asked a prosecutor — Jennings — for guidance and the prosecutor refused to examine the warrant. “I will never for political expediency throw someone under the bus,” Newell said. Jennings said he would bring experience to the District Attorney’s Office, mentor younger prosecutors and prosecute high-profile cases. He’d reduce the amount of plea bargaining that occurs. “When I file a felony, I’ll mean a felony, not a misdemeanor down the road,” Jennings said. Newell said his main goal is to keep Nevada County safe, adding that recidivism is dropping. He argued voters need a steady, tempered and experienced leader. “Ladies and gentlemen, this is no place for a training field,” Newell said. A forum for the three candidates running for county clerk-recorder/registrar of voters preceded the district attorney discussion. The candidates are Mary Anne Davis, incumbent Gregory Diaz and Elise Strickler. The topic of elections dominated the clerk-recorder/registrar of voters forum, though the office also is responsible for the maintenance of records for marriages and deaths. Many questions focused on the Voter’s Choice Act, a new method of voting Nevada County residents will use in the June 5 election. Every registered voter will receive a vote-by-mail ballot. 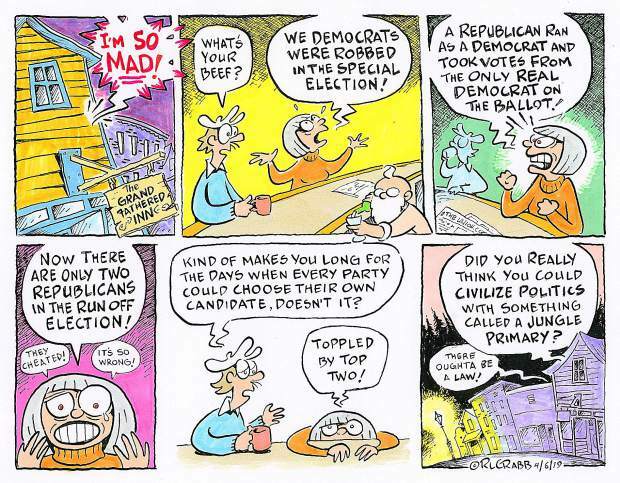 Precincts will disappear, replaced by a fewer number of vote centers. Those centers will remain open for days before June 5. People can vote in person at the vote centers, drop off their ballots at designated spots or mail them. Fielding a question about supposed chaos in the implementation of the voter act, Davis — an employee of The Union — pointed to collaboration and communication with other local officials as key. She said teamwork is essential. “I have the leadership, I have the management, I have the communication skills,” Davis said. The Nevada County Board of Supervisors initially balked earlier this year when Diaz formally presented the act to them. Supervisors and Diaz later reached an agreement. Diaz said he regrets not having the county executive officer present and for not providing better answers to supervisor questions. “Sometimes, in terms of making sausage, that’s what legislation is like,” Diaz said, adding that his office was transparent and vocal about the act. Strickler, a former employee of the clerk-recorder, said more communication with supervisors would have avoided the discord. Looking to the office’s future, Strickler again pointed to communication. She wants to have training for political candidates, teaching them deadlines and how to interact with the clerk-recorder’s office. Davis said she wants the office’s staff to receive more cross-training. Additionally, the office needs strong leadership. “I’d learn every job in that office so I could back them up,” Davis said. Diaz said the June 5 election will provide data about the implementation of the Voter’s Choice Act. State leaders want to see his office’s evaluation of the act. “One thing that should stay constant is my being clerk-recorder, that’s clear,” Diaz quipped. The forum was sponsored by the League of Women Voters of Western Nevada County. The group’s next forum, about the U.S. House of Representatives 1st Congressional District race, is scheduled for 7 p.m. Thursday at the Eric Rood Administrative Center, 950 Maidu Ave.